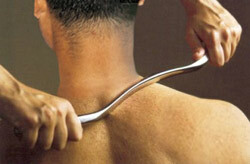 Gua Sha is a traditional Chinese medical treatment used by acupuncturist to allow meridian energy to flow freely. Graston technique is based upon Gua Sha but used different tools. The treatment involves breaking up trigger points/knots, muscle spasms, scar tissue and adhesions that develop in our muscles. They develop from new injuries, old injuries and poor posture. This blocks energy flow and blood circulation causing stagnation in the meridians, ill health and pain. Dr. Karas learned Gua Sha while obtaining his fellowship in acupuncture and Graston from one of their seminars. The treatment involves a scraping motion over the skin with a smooth-edged tool. Gua means to scrape and Sha means sand or the rough irregular texture of the muscles, fascia and tendons. Gua Sha tools are made of jade, buffalo horn or smooth stone while Graston tools are stainless steel. Dr. Karas has used Gua Sha and Graston to successfully treat TMJ, carpal tunnel, rotator cuff, IT band and many other soft tissue injuries. He has found that, by breaking up these trigger points/knots, muscle spasms, scar tissue and adhesions, patients respond faster and the results last longer.